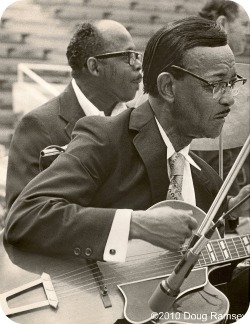 This is neither the anniversary of Danny Barker’s birth (January 13, 1909) nor of his death (March 13, 1994). I need no special occasion to write about Danny. He was born in New Orleans, where I served with him on the board of the original New Orleans JazzFest and was lucky enough to become his friend. No one has ever had a warmer, more genuine companion. Largely because he reverted to banjo after he returned home in the ’60s, Danny has been typecast as a traditionalist and, because of his singing, as an entertainer. Both labels apply, but there was more. He was a musician of wide scope, deep harmonic knowledge and the gift of swinga catalyst in any musical setting. As a very young man, he played with Jelly Roll Morton and Sidney Bechet and, after he moved to New York, with James P. Johnson and Henry Red Allen. 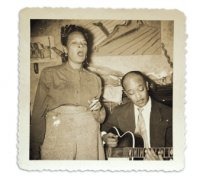 In the 1930s, he was the rhythm guitarist in some of the best bands of the decade, including those of Lucky Millinder, Benny Carter and Cab Calloway. Barker provides propulsion in this piece from a 1939 Teddy Wilson all-star date within solo orderWilson, Benny Carter, Roy Eldridge, Carter, Billie Holiday, Eldridge, Wilson and Ernie Powell. Milt Hinton is the bassist, Cozy Cole the drummer. As bebop was developing in the early 1940a, Barker and his bassist chum Milt Hinton from the Calloway band jammed with Charlie Parker and Dizzy Gillespie. He recorded in 1945 with pianist Sir Charles Thompson in a not-quite-bop session that also included Parker, Dexter Gordon, Buck Clayton, bassist Jimmy Butts and drummer J.C. Heard. Be patient; it takes the disc jockey half a minute to get the needle onto the record. Barker was a superb natural entertainer who reached into his Creole heritage to give authenticity to pieces like this one at the Ascona jazz festival in Switzerland. I tried to find a recording that I could embed of Danny singing his most famous composition, “Save the Bones for Henry Jones.” No luck. You’ll find it on this album. “Save the Bones” was a hit in separate versions by Nat Cole and Johnny Mercer. Here, they collaborate on the song in one of Cole’s television programs in the 1950s. During his later years, Danny was curator of the New Orleans Jazz Museum and grand marshal of the Onward Brass Band. He and his wife, the singer Blue Lu Barker, frequently performed together. They are pictured here in 1950 or so (courtesy of the Tulane Hogan Jazz Archive). Danny took under his wing developing young musicians, including Branford and Wynton Marsalis and Nicholas Payton, and helped them to absorb the New Orleans tradition and spirit. He never flagged in doing all that he could to insure that the city’s music thrived. New Orleans has a big place in its heart for Danny Barker, and so do I.
I loved this post. Thanks. I remember seeing Danny in New Orleans many times. In the summer of 1960 I had a summer job working at Freedomland, an amusement park in the Bronx, NY. One of the attractions was a replica Mississippi steamboat, and on it, Danny Barker played the banjo, wearing, if I remember correctly, a red and white striped blazer and straw hat. I was mildly saddened to see a great musician in what I perceived to be inferior circumstances to his talent, but when I introduced myself and broached the subject, he patiently and kindly explained to the callow youth I was about being a professional musician and making a living. Here is a YouTube clip of him backing Jimmy Giuffre and Pee Wee Russell (Jo Jones on drums) from the Sound of Jazz LP (not the same as the TV show of a few days later. Clips from the show are on YouTube, but couldn’t find one for the live performance. We didn’t hear much of Danny Barker this side of the pond. I do have a couple of nice pictures of him I took at New Orleans JHF with his banjo and a sharp trilby hat -1988, I think. I’m looking for his grave site. to pay homage and respect. Does anyone know where in Lafayette 2 he’s strumming in his rest? Danny is buried in the Société “L’Union Sacrée”/Barbarin Family/Musicians’ Tomb located on the St. Louis Street side of St. Louis Cemetery No. 1 in New Orleans, LA.